Our television went out two days after Christmas. Not before, when we could take advantage of all the “super whamo” sales going on, oh no, we must go shopping for a television after Christmas and three weeks before Super Bowl. This is our luck, always, a day late and a dollar short. After searching all the usual stores online and comparing pricing, size and options, we settled on a television at Costco. The price was good and had a lot of options that we didn’t have on our old tv. It wasn’t as big as we wanted, but we weren’t ready to fork over that much money to get seven more inches. Now days, televisions are a lot lighter and easier to carry into the house and get set up. Not like earlier televisions that took three strong men to lift and tote. This made it possible for just the two of us to maneuver it in the truck, out of the truck and in the house. We didn’t drop it once, a clear miracle for me. After disengaging the old tv from the mounting, Mitch set about setting up the new television on the brackets to mount on the television stand. We lifted the television, carried it to the mounting and set it on the stand. We stepped back and noticed it was tilted a bit, with one side lower than the other. The level showed the bubble off to the right just a smidge, which after measuring with a tape measure, translated to about a quarter of an inch difference. We tried loosening the bolts and lifted one side a bit, then tightening the bolts back up. We stepped back and the television looked higher on the other side now. Evidently we moved it up too much. Back to loosening up the bolts and tried adjusting again. Now we were off more than an inch. We took the television off the mounting to readjust the brackets on the television, reattached the tv to the stand, now the television was too low on the stand, sitting on the DVD player, how did that happen? We took the television off the stand again. Mitch readjusted the brackets again, reattached the television to the stand and now not only was it crooked, but it was tilted forward, and we weren’t drinking, YET. We ran out of time and had to leave the television face down on the cushion in front of the sofa for the night. This morning we started again, with the readjusting of the mounting brackets. After readjusting again, we were now off that quarter of an inch. We were making progress. We loosened the bolts again and lifted my end a touch. Guess what, too much, we were now a quarter of an inch too high. I was ready to give up, who is going to notice a quarter of an inch? I put the level on top of the television and the bubble was a smidge to the right, again. Surprisingly, Mitch was hanging in there, working on perfection. I was the one about out of patience. One more time, I said, I am about done. We are never going to get it dead on and I really didn’t care anymore. One last time, Mitch loosened the bolts on the brackets attached to the television, we lifted my end the equivalent of the thickness of a sheet of paper. Close enough. Standing back the television looked level, close enough for horseshoes and hand grenades. And tonight there will be drinking. The rainy season is over and summer is nipping at the heels of spring. This year I’m hoping to get more traveling in and do some exploring. 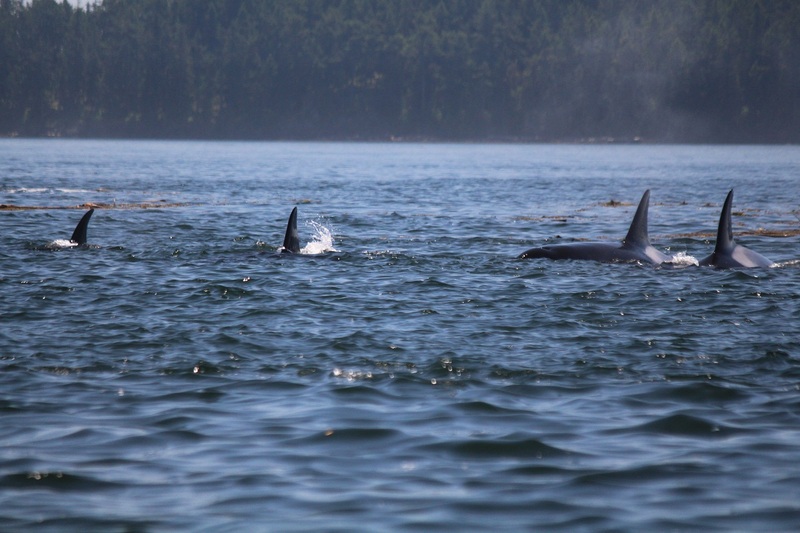 For our spring vacation, we took a trip to the San Juan Islands, staying at Friday Harbor, to go whale watching. For this vacation there was a lot of pre-planning involved months before our actual trip. We found out last year that during the summer months here everyone is traveling around experiencing all this state has to offer and almost every vacation spot is booked up months and even up to a year in advance. I had to book the hotel, dog kennel stay and whale watching boat in January for a May trip. Then as it got closer to our trip, a month out, I had to make reservations for the hour-long ferry ride to the island. So much pre-planning and time scheduling was stressful. We had to be in the line for the ferry forty-five minutes to one hour prior to sailing in order to ensure a spot on the boat. Couple that with the traffic here going north through Seattle, we had to be on the road about six hours early just to drop off the dogs, fight commuter traffic and drive the hundred nineteen miles to the ferry terminal. Not our normal vacation style of heading out then stopping when and where we want. Anyway, the trip was amazing. The weather was just perfect, sunny with highs in the high sixties and low seventies. We couldn’t believe our good fortune. Our hotel was a mile away from the harbor and decided that instead of driving down and looking for parking each time, we would walk down to the docks on each trip out. The company we went with for the whale watching was Maya’s Legacy and we couldn’t have been given a better experience. The crew, captain and two mates, was wonderful, informative and very helpful. We were a small group, thirteen of us plus the crew, so we were given much more personal attention than other boats we saw that had over thirty people on the decks. Every time the captain or one of the crew saw something of interest we would stop for sufficient gawking and photos. 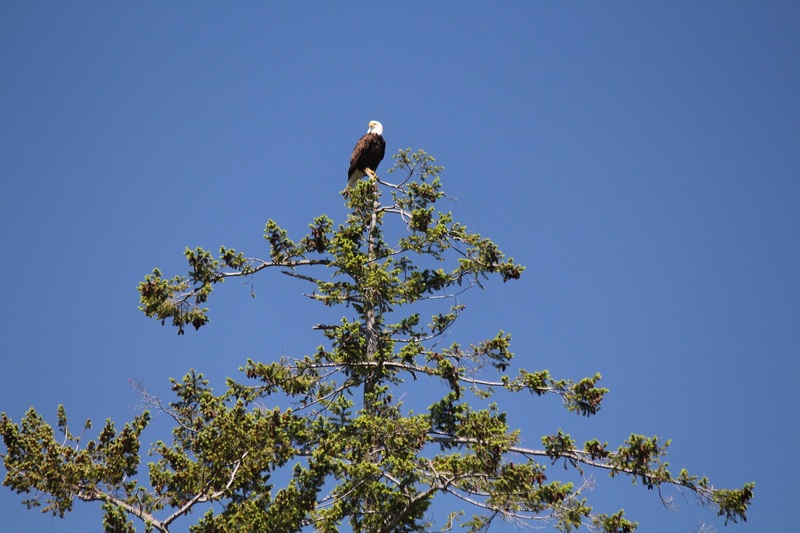 We saw bald eagles perched on the tops of trees scanning for lunch. We turned north and headed toward Canada looking for Orcas. We found a pod with four whales and as one of our crew pointed out, we were having a National Geographic moment, watching the whales feeding. What I was surprised to see was that all of the boats talked to each other and let others know where to find the whales, in order to provide a great experience for everyone out on the water. After watching them for a while, I figured we would head back, but no, our captain said we were on the search for another pod that consisted of a mother, her son and daughter. We found them farther north and again, we were all in awe of the beauty and magnificence of the animals. 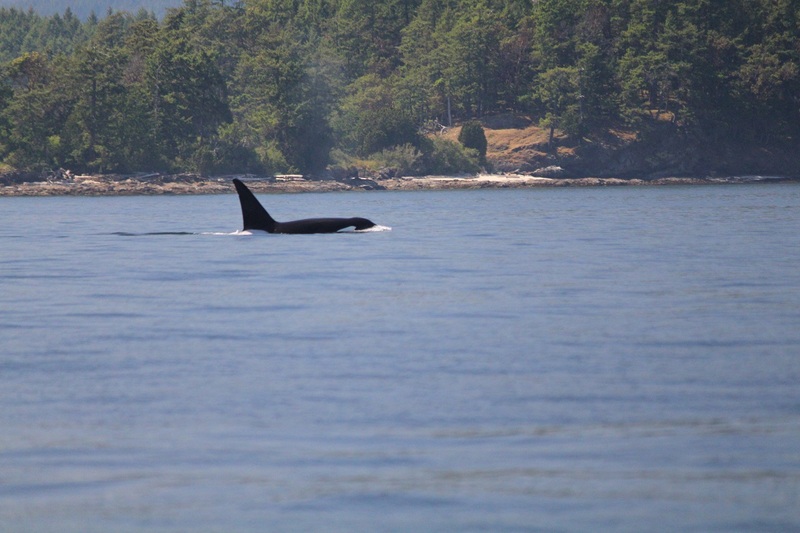 The male Orca had a dorsal fin that was over six feet high. I could hear the water being expelled from their blow holes each time they broke water. After we had been on the water for over two hours, we turned around and headed back. On the trip back we came upon a group of harbor seals feeding on fish and a group of sea gulls flying around them trying to steal a bite or two. Definitely a trip that was well worth the pre-planning, one that we won’t forget for some time.